To replace one or more missing teeth without affecting adjacent teeth. To resolve joint pain or bite problems caused by teeth shifting into missing tooth space. To restore a patient’s confident smile! To restore the ability to eat and speak without loose dentures. Saves bone and surrounding teeth. To restore or enhance facial tissues. To support a bridge or denture, making them more secure and comfortable. 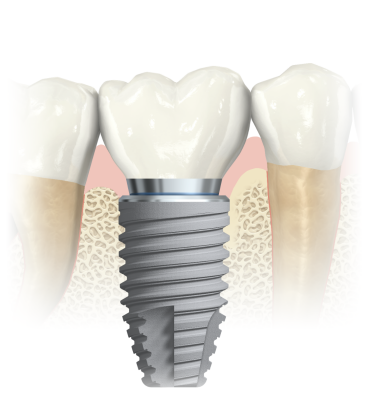 An implant is a small metal anchor that is inserted into the jawbone to take the place of your missing tooth root. After a minimally invasive surgery, an artificial tooth is attached to the implant, enabling normal function and natural tooth appearance. Missing teeth? You are not alone! 69% of adults between the ages of 35-44 have lost one or more of their permanent teeth. Tooth loss happens from decay and gum disease, and as a result of injury, cancer or simply wear. .... Compromising your quality of life! Whenever teeth are lost for any reason, it is important to talk to a periodontal professional about tooth replacement options. The entire procedure usually takes six to eight months. Most patients do not experience any disruption in their daily life. You will receive care instructions when your treatment is completed. 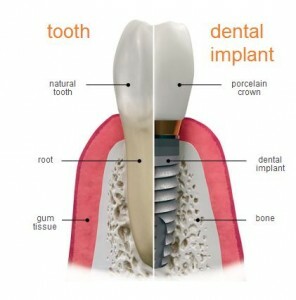 Good oral hygiene, eating habits, and regular dental visits will aid in the life of your new implant. During your consultation, Dr. Kennedy will address your specific needs and considerations. Your questions and concerns are important to us and our team will work with you very closely to help make your procedure a success.